Safeer Ramadan Booklet. Valid at all emirates except Dubai from 25th April to 10th May 2019. Safeer 2-20 Promotion. 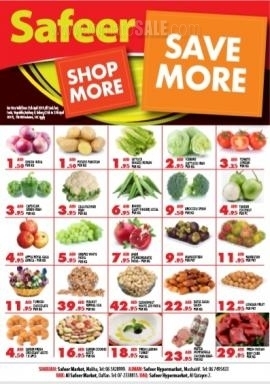 Offer valid from 11th April 2019, till stock last, Fruits & vegetable ( 11th to 13th April 2019 ), T&C apply. 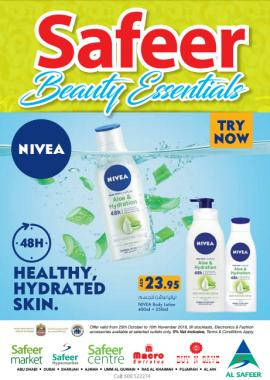 Offer available at Safeer Stores across UAE. 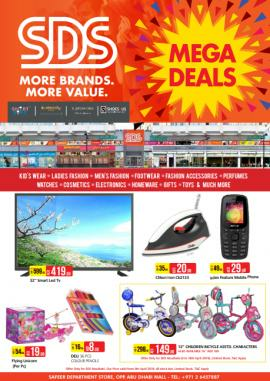 SDS Mega Deals. Offer valid from 9th April 2019, till stock last. Offer available at Safeer Department Store, Opp. Abu Dhabi Mall. SDS Inaugural Offer. Offer valid from 27th Mar - 10th April, 2019. Offer available at Safeer Department Store, Opp. Abu Dhabi Mall. Safeer back to school. Offer valid from 27th Mar - 10th April. Offer valid at all Safeer Branches except Dubai. Safeer Digital Fest. Offer valid from 16th March 2019, till stock last, T&C apply. All branches except Dubai. 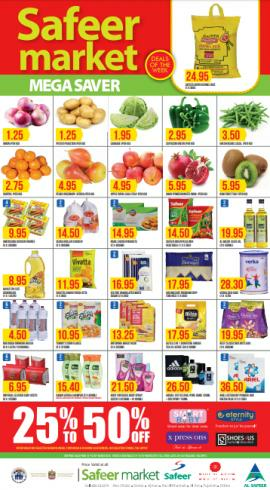 Safeer Market Mega Saver offer. 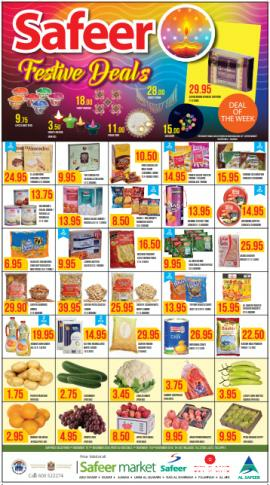 Valid from 14th to 20th March 2019. Safeer Cost to Cost. Offer Valid from 27th February 2019, till Stock lasts, T&C apply. All branches except Dubai. 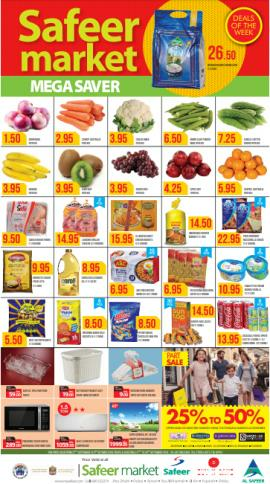 Safeer Market Mega Saver offer. Valid from 28th February to 6th March 2019. 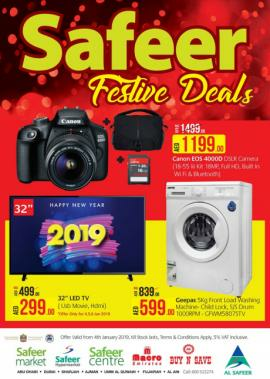 Safeer Festive Deals. Offer valid from 24th January 2019, till Stock lasts, T&C apply, 5% VAT inclusive. All branches except Ras Al Khaimah. 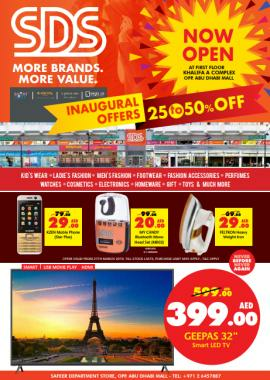 Safeer Festive Deals. Offer Valid from 4th January 2019, till Stock lasts, T&C apply, 5% VAT inclusive. 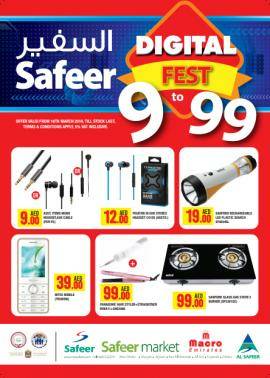 Safeer Mega Saver New Year offer. Valid from 27th December 2018 to 2nd January 2019. 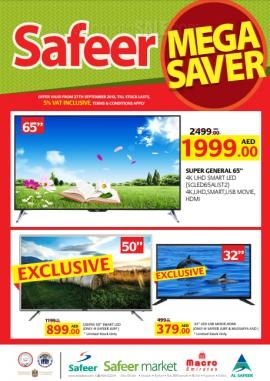 Safeer Mega Saver offer. 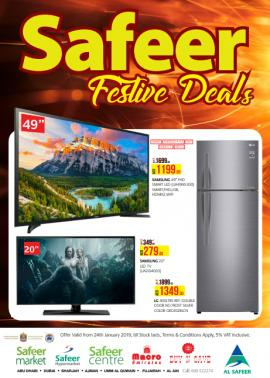 Valid from 20th to 25th December 2018. Safeer Beauty Essentials. Offer valid from 25th October to 10th November 2018. 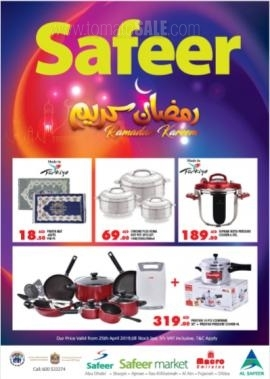 Safeer Festive Sale. 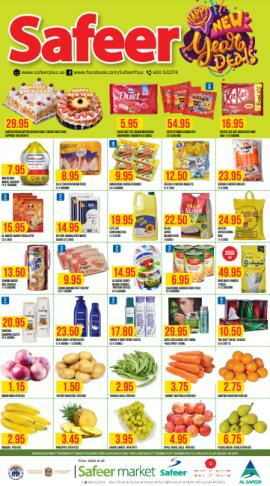 Valid from 1st to 7th November 2018, Fruits & Vegetable 1st to 3rd November 2018. 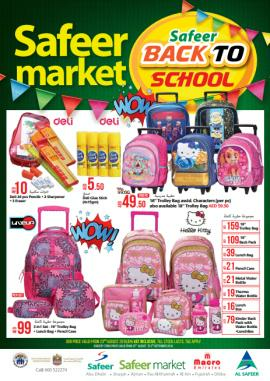 Safeer Market Mega Saver offer. Offer valid from 27th Sep - 10th Oct. All branches except Dubai. 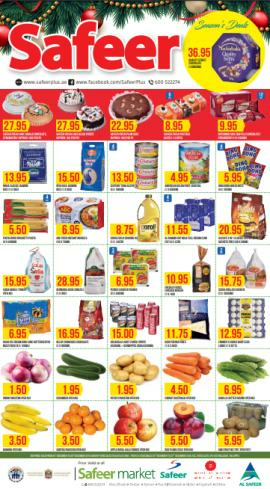 Safeer Market Mega Saver. Offer valid from 4th to 10th October 2018. 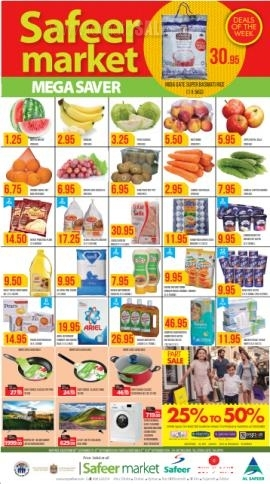 Safeer Market Mega Saver Offer. Valid from 27th September to 3rd October 2018. 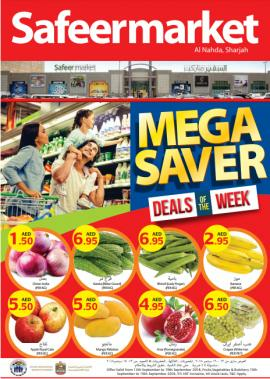 Safeer Market Mega Saver offer at Al Nahda, Sharjah. Offer valid from 13th to 19th September, 2018. Fruits, Veg & Butchery 13th to 15th September 2018. 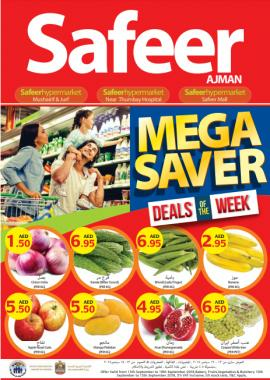 Safeer Market Mega Saver offer at Ajman. Offer valid from 13th to 19th September, 2018. Fruits, Veg & Butchery 13th to 15th September 2018. 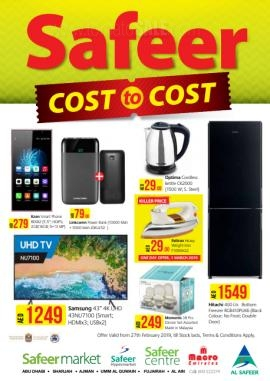 Safeer Market Mega Saver Offer. Valid from 6th to 12th September 2018. 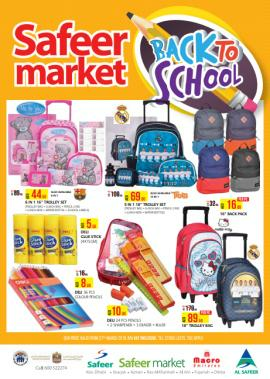 Safeer Back to School Offer. Valid from 23rd August 2018. 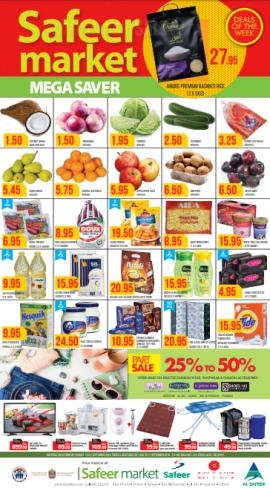 Grocery items prices valid from 23rd August to 3rd September 2018. 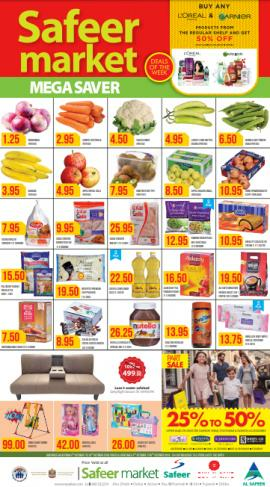 Safeer Market Mega Saver Offer. Valid from 30th August to 5th September 2018. Today's supermarket industry is a constantly changing business sector. Participants in it must always be on the lookout for new ways to satisfy customer demands. Running a successful independent supermarket involves embracing out-of-the-box thinking to drive revenue and profits. we have a wide variety of high quality brands of supermarket goods , which we provide at very affordable prices . 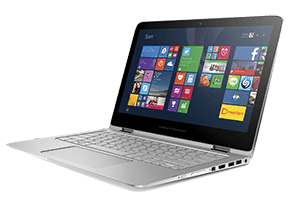 Get all information about Safeer Market offers in UAE, Safeer Market Special Offers, Safeer Market Sharjah offers, Safeer Market latest offers, Safeer Market sale in Abu Dhabi, Safeer Market catalogue, Safeer Market Ajman offers and Safeer Market promotions by browsing through TomatoSALE.